The best friend, guide and wisdom for your journey to success. Everything we wish we knew on our 10 year journey to conceiving our son against all odds that would have meant it would have not been a 10 year journey. Let go of stress, anxiety and fear of not getting pregnant. Feel more whole and bring flow back to life even ahead of getting pregnant. A section just for the men, written man to man. Feel more in control by harnessing the power of the mind-body link to guide your body to success. Russell Davis is a fertility Coach and Cognitive Hypnotherapist, writer and speaker and helps people remove psychological blocks to getting pregnant. Russell’s personal experience echoes his belief that too many couples go through fertility treatment unnecessarily and that the success rate of treatment is unnecessarily low. Whether natural or assisted conception, Russell has helped hundreds of couples all over the world move from despair to hope to success. 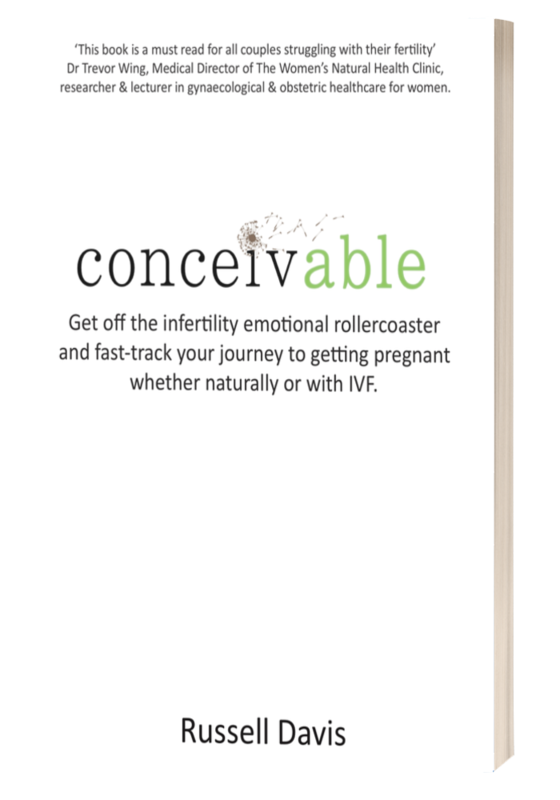 Russell founded The Fertile Mind fertility mind-body programs and coaching based on he and his wife’s 10-year double infertility journey which resulted in the natural conception of their son. Russell is a therapy supervisor and Registered and registered under the UK Governments Complementary and Natural Healthcare Council (CNHC) adhering to their strict code of ethics.